Back in September of last year, we announced a partnership with The Coffee Bean & Tea Leaf to bring wireless charging to its cafes for customers who want to recharge their phones on the go. Now, we’re seeing the first results of that collaboration. It’s no secret that the CES expo in Las Vegas can be an extremely draining experience for both humans and smartphones alike, and so we’re happy to bring wireless charging to The Coffee Bean & Tea Leaf café at The Venetian Casino, Hotel & Resort—one of the first locations in the country to feature this. The wireless charging is built into the tables at the café, so all you need to do is put your phone down on one of the marked areas on the table, and your phone will begin to charge. The technology is based on the Qi wireless charging standard, and the first time you give it a go, it feels quite magical. You do need to have a smartphone with built-in wireless charging such as the Nokia Lumia 920 or to equip your phone with a wireless charging shell such as those available for the Nokia Lumia 822, 820, and 810. The café offers fresh-roasted coffees, iced drinks, and specialty teas, so if you’re ever in Las Vegas, we encourage you to stop by the location and recharge yourself as well as your phone. The Coffee Bean & Tea Leaf at The Venetian Casino, Hotel & Resort is located on the Shoppes Level right when you enter from the valet service or the parking garage. This is just the first step, as we plan to introduce integrated wireless charging plates into The Coffee Bean & Tea Leaf cafés in select major metropolitan cities across the United States. 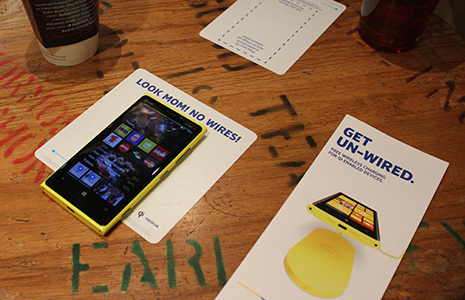 Have you used wireless charging with your Nokia Lumia?